A Musky’s a Musky. And It Hates You. “Hey, a musky’s a musky,” I said, after it had ghosted back into the green murk. “What do you mean?” my wife asked, folding the net back up and stowing it. “A little one? !” She was incredulous. But she’d never seen a musky in person before; I don’t catch very many. The fish we’d just released was under thirty inches long – a little one. “They get a lot bigger than that,” I said, though the knowledge is mostly academic. I’ve not seen any really big ones in person, either. Besides, this was a tiger musky, a musky-pike hybrid, and they usually don’t reach really big status. But in the summertime, they are convenient, and are the good-enough while we wait for the perfect. 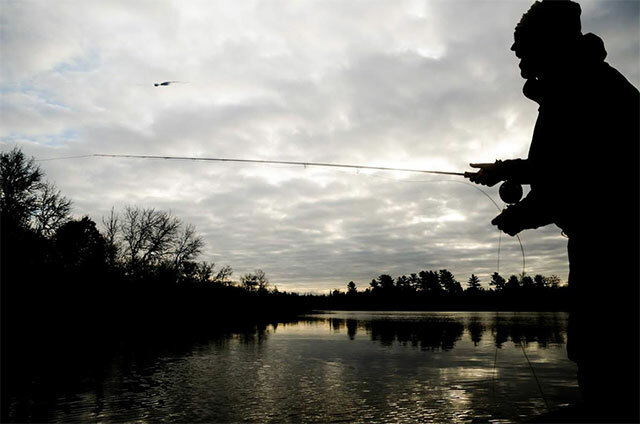 The Minnesota DNR grows tigers and stocks them in these small metro lakes, which are over- fertilized and over-crowded with recreators and stunted panfish. 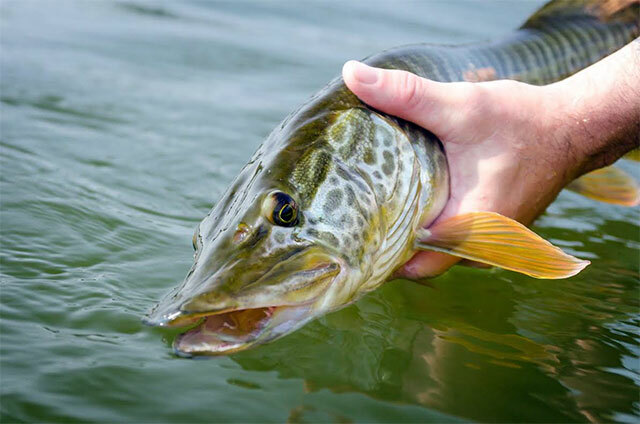 Being hybrids, the tiger muskies cannot reproduce. But they hunt and eat as if they have a genetic future, like Ridley Scott’s Replicants searching for humanity off the shoulder of Orion. Despite the freeway noise, algae blooms, and wakeboarders, these fish are wild in spirit if not lineage. From June through late August, when busy summer real-life keeps me close to home, they are more than good enough. But fall – fall is perfect. The harvest moon quintuples the Esox’s need to eat. I can feel it. You feel it, too. The shorter days and crisp mornings. Fall is a time of traditions: hunting, harvesting, giving thanks. The freshening cool and smell of falling leaves infuses experiences with meaning and nostalgia even as they are happening. 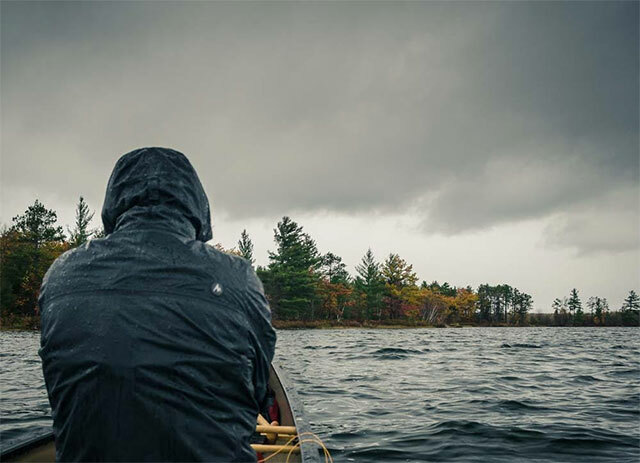 Add to this the blinding adrenaline rush of a boatside Esox attack, and a fall musky trip can become a tradition in one iteration. Anymore, the only fall color that matters to you is the gold-green flank of a wild and native north woods Esox. And whatever color it’s eating. That is not to say that it is always fun. Fall musky fishing is hard. You will trade your flip flops and polyester for Smartwools and flannel. Longer trips, measured in days instead of hours. So much casting. Your hand tendons begin to abrade their assigned bones in an almost audible rasping pain. And elbows; maybe shoulders. There is no cure for this except rest; but the muskies are not resting. They are eating. For now, pass the NSAIDs. And it is cold and wet. Sometimes just cold. The musky loves this. You learn to love it, nursing tendonitis and neglecting career and general health, because the next musky might be a four-foot-plus duck-eater. Or it might be a little one. But a musky’s a musky. Even a small one thinks it’s big. Once a musky reaches thirty inches, it is the neighborhood bully. It can successfully eat prey up to one-third its own length. It will try for bigger. You can’t tie a fly that’s too big for a musky to eat; you can tie one that’s too big to cast. Therein lies the balance. Just look at the musky’s face: dark, soulless eyes, raking brow, toothy underbite. This permanent expression clearly telegraphs intent across the piscine-hominid gulf. Muskies operate with malice. They do not “forage,” they commit first-degree serial murder. For example: you do not present that huge fly to a musky. It’s not like casting to a rising trout or a cruising carp, both of which operate within a system of rules. If you know and follow these rules, you catch these fish. It’s almost a team sport. But this is not trout fishing. There are no rules, no teams. A musky must be antagonized with the fly. Like a big cat, it doesn’t want to chew on a motionless toy. It wants to chase, catch, and kill it. And then maybe eat it. Sometimes the musky chases and then loses interest for no reason. Or slashes and misses when it could easily not miss. As if it enjoys terrorizing prey even if it doesn’t intend to eat it. When it’s a fly that’s being mock-charged, it feels like it enjoys terrorizing you. It’s sociopathic. And sometimes the musky commits. Bass inhale; trout sip. The musky bites. It coils itself like spring steel and, at thirty miles per hour, clamps onto its prey, impaling it on dual rows of tenpenny fangs, as permanently as a lion bites a wildebeest. The inside of the musky’s mouth is lined with a thousand tiny Velcro-teeth which stick to your bucktail fly like they were made to. You must rip the fur through those teeth if you hope to set the hook. It takes doing, and not with your rod tip. Just strip. 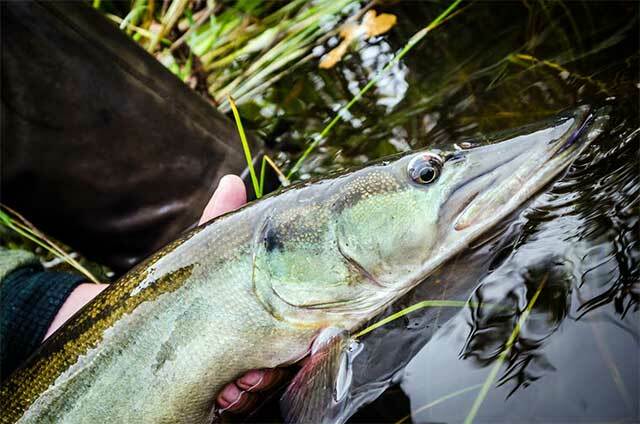 If you do get a hook to stick, the musky does not run, does not ask to be put on the reel. It steps up, looks you in the eye, and, assuming you are trying to kill it, tries to kill you right back. And then you have to bring it in the boat. When you release it, it does not forgive you. Boiled right down, it’s absurd. The hardship, the musky’s unreckonable decision-making, and if you’re lucky and good, the fight, the elation, and the release. You are still cold and wet, still have tendonitis and the musky goes on killing. The whole thing is absurd. But it’s fall. Up north, the leaves are changing, the water is cooling, and everything shorter than thirty inches that swims is afraid. Your eyes are red-rimmed, a little too wide. Four-day weekend coming up; brand new nearly-uncastable flies and a fresh bottle of Aleve in the boat.